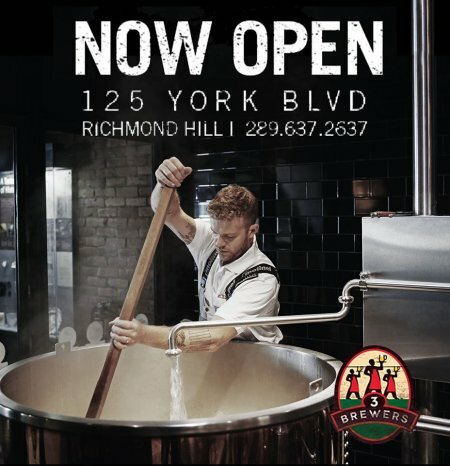 RICHMOND HILL, ON – Brewpub chain The 3 Brewers has announced the opening of its newest location in Richmond Hill, a town in York Region just north of Toronto. Located at 125 York Blvd., The 3 Brewers Richmond Hill is the fifth of the chain to open in the Greater Toronto Area, and the 18th overall in Ontario and Quebec. Once a rich farming area, what we know now as Richmond Hill was once named Miles Hill. While the origins of the name is a matter of some debate, one thing we know for sure is that by 1836 this fast-growing community received a postmaster and that’s when the name Richmond Hill began to appear on maps. We admit to a special fondness for Farmhouse Ale as it hails from our beautiful home country, France. We’ve called this one the Postal Farmhouse, honouring both the community’s farming roots and the way it got its name. For more details, see the 3 Brewers Richmond Hill webpage.